Surveys ask: should we worry about microbeads? Should we worry about microbeads? A global campaign, Beat the Microbead, continues to grow huge numbers of supporters in the United States – but, surveys show, relatively few people in the UK have heard about it. Are microbeads something we should be worrying about here in Britain? Microbeads are tiny plastic particles that are found in a wide number of personal care products; such as face creams, exfoliating shower gels, face washes and toothpastes. The companies who manufacture the products sell these as a positive ingredient, to help exfoliate skin. However, these man-made plastic particles do not break down, are non-biodegradable and cannot be filtered out in the sewer system. Therefore, billions of plastic microbeads appear to be entering our water system, are subsequently ingested by marine life and therefore manage to enter our food system. Greenpeace have produced a handy poster to highlight the issue. According to a recent survey by ASC’s Microplastics Project, 90% of their ocean surface water samples contained microbeads, and lakes surveyed around the southern states contained up to 1.7 million microplastic particles per square mile of surface water. Interestingly, in June 2015 a report was released by the UN Environment Programme (UNEP) which outlined a precautionary approach to the use of microbeads in cosmetics, with the recommendation of phasing them out with an eventual ban on their usage. The report cited a survey which detailed over 299 million tonnes of plastic was produced worldwide in 2013, costing approximately US$13 billion per year in environmental damage to marine ecosystems. With microbead usage on the increase, this figure is set to rise by the time the next survey is published. 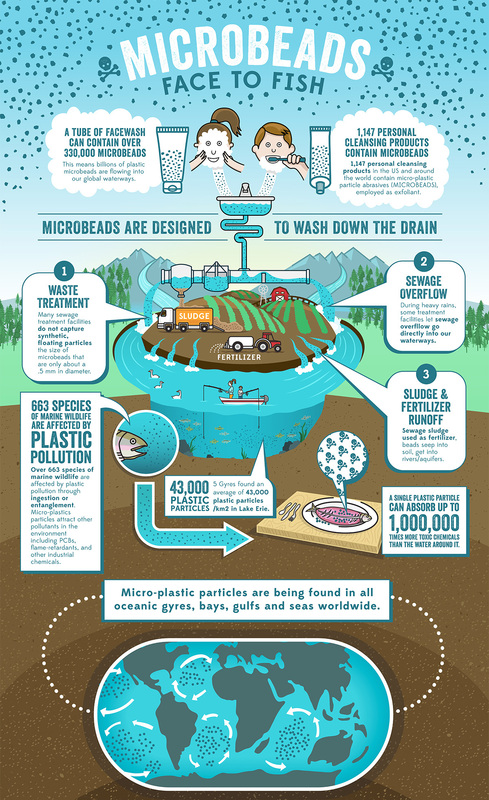 What is being done about microbeads? Following successful campaigns, Unilever was one of the first big companies to say that they wanted to be microbead free by 2015. The Dutch Cosmetics Association announced that Beiersdorf, Colgate-Palmolive and L'Oréal were stopping the use of microbeads, whilst Procter & Gamble said that their products would be free from microbeads by 2017. Johnson & Johnson said it has already started phasing out microbeads, and is no longer developing products containing microbeads. Meanwhile, the state of Illinois has banned the sale of products with microbeads, and Ohio, New Jersey and New York are planning to do the same, as is Toronto in Canada. With market research showing just how many products contain microbeads, it can be tricky as a consumer to avoid buying the products which contain them. One of the big campaign groups has a website where you can check which products contain microbeads, and the look for the zero campaign has a list of brands which are microbead free. You can also sign Greenpeace’s petition to David Cameron, if you’d like to see action taken on microbeads in the UK. What do you think? Are you concerned about microbeads, or do you think it’s nothing to worry about? We’d love to know your thoughts – join the discussion on Facebook and have your say. Love sharing your views? At Opinion Outpost, we want to hear your opinions! Have your say in paid online surveys for cash. Sign up for free and get paid to share your opinion in our flexible online surveys.